In October 2018, we left Toronto and headed south to Mexico to experience Dia de los Muertos in Oaxaca. We had almost two weeks before the festivities began, so we started out in Mexico City. Mexico City was a wonderful place to start our next Mexican adventure. This huge city is split into more easily digestible neighbourhoods and has a lot to discover. We were surprised at how dog friendly the city was in general, with everyone walking their dog, shops having dog friendly bowls out front, and even being allowed to bring your four-legged friends into a lot of the trendy bars. 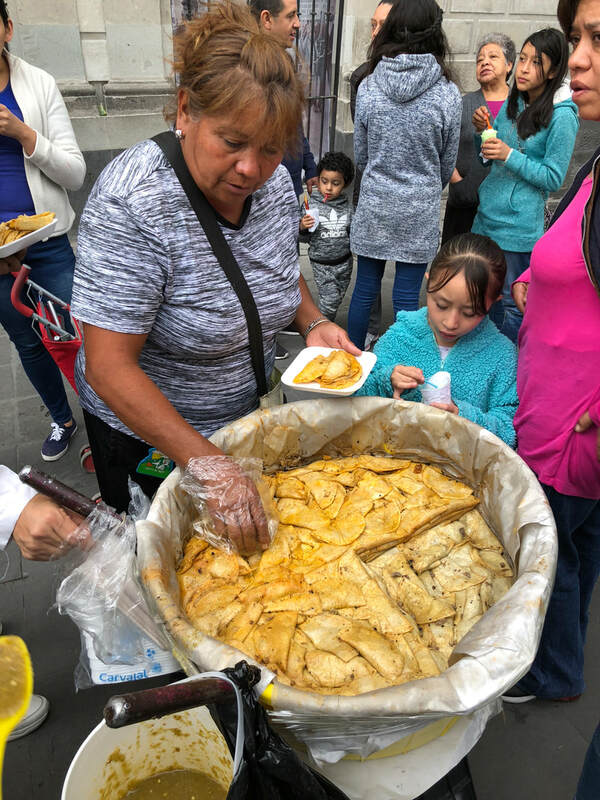 The food is another reason to love Mexico City. There are so many choices, from nice, modern restaurants to street food options. We loved finding the most local places we could, which were often plastic furniture in a tiny hole-in-the-wall type venues. There are so many dishes to taste, you will never get bored of eating. The local markets also make for a great place to discover new culinary delights and plenty of other sights and sounds that give you an idea of life here. ​The Centro Historico is the heart of the city centre. The beautiful Metropolitan Cathedral overlooks the ​Zócalo, a huge plaza where people meet and events take place. Just behind the Cathedral, you will find the remnants of the Templo Mayor. There are few other places where the contrast between old and new is so glaringly apparent. ​An easy 15 minute walk through the city centre from the Zócalo will bring you to the white marble Palacio de Bellas Artes. The building itself is a sight to see and next to it you will find the city's oldest park- Alameda Central. Hundreds of people gather here in what is claimed to be the oldest public park in the Americas, established in 1592. ​Further west in the city, you will find The Castillo and Bosque de Chapultepec. The castle sits on top of "grasshopper's hill"- a hill the Aztecs considered to be sacred. This is the only royal castle in North America that actually served as a residence for royalty. The short climb up is worth it for the views of the city below. 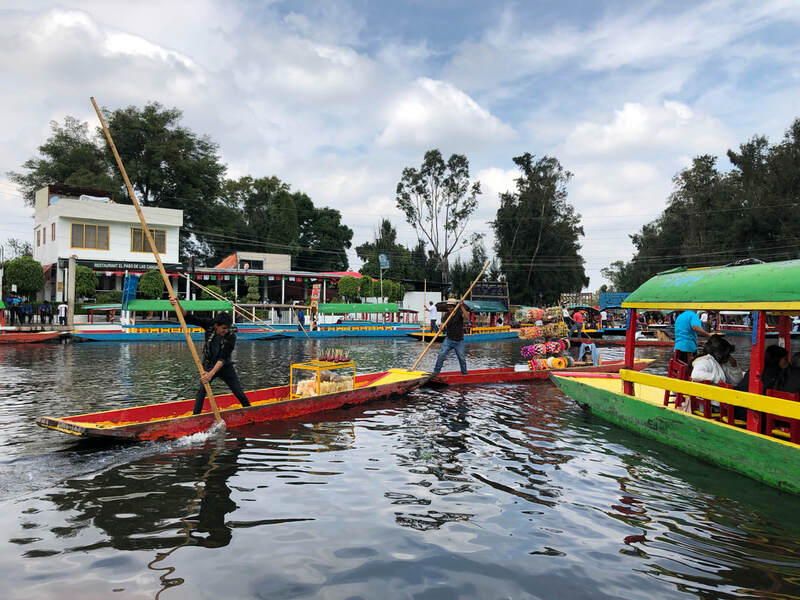 ​For an afternoon escape from the city, head south to the canals of ​Xochimilco. Be prepared to haggle hard or get taken advantage of as a tourist. But once you agree on a price, sit back and relax as your poler pushes you through the droves of other boats. For a real experience, head there on Sunday afternoon when most boats are full of locals and the vendors are out in full force. You can buy anything your heart desires, from snacks to beer to flower crowns, without having to leave your boat. If you want to be serenaded, you can also have a mariachi band step on board for a few songs- at a price of course. ​A few other neighbourhoods worth a stroll are Coyoacán, with it's vibrant buildings, parks and the Frida Kahlo Museum, Roma with the super modern ​Mercado Medellín, and La Condesa at the edge of Parque Mexico & Parque España. ​As an odd side trip, the Biblioteca Vasconcelos can be found a 20 minute walk northwest of the Alameda Central, near the Buenavista metro stop. The suspended bookshelves create the architecture of this library and sets is apart from most. You can visit the different levels to discover different vantage points within. ​Lucha wrestling is another must see while in Mexico City, and it doesn't get much more theatrical than at Arena Mexico. Tickets are cheap and can be purchased online through Ticketmaster or at the door. Shows are Tuesdays, Fridays and Sundays. Buy a mask on your way in from a stall on the street, get a beer from one of the hawkers inside, and enjoy the slightly ridiculous show. ​If you still have a day free while visiting Mexico City, a trip to Teotihuacan is a must. Located about one hour northeast of the city, this archaeological complex is impressive and you are still able to climb to the tops of the pyramids. Make sure to visit the ​Palace of Quetzalpapalotl to see the impressive murals and carvings. 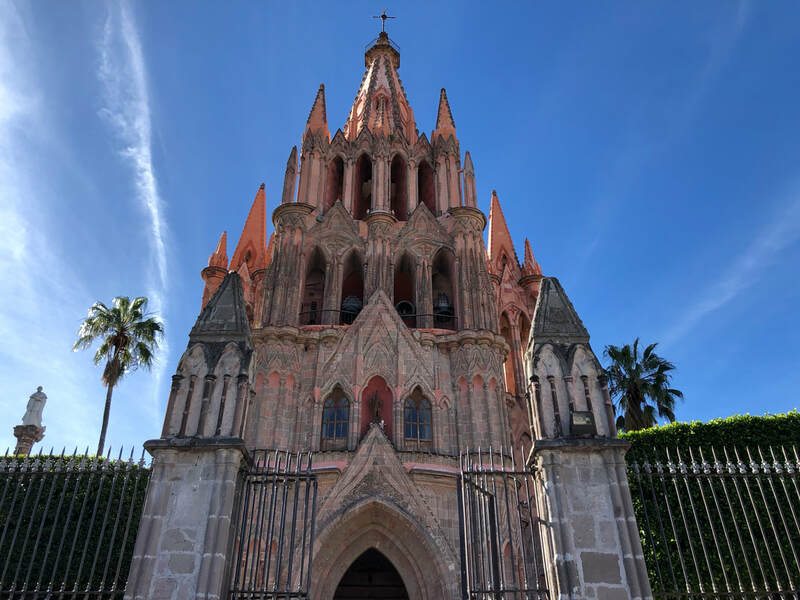 ​Our second stop was the small town of San Miguel de Allende, 3.5 hours northwest of Mexico City. This colonial era town is known for its unique architecture. The cobblestone streets are easy to explore on foot, and there are several rooftop patios that offer amazing views. 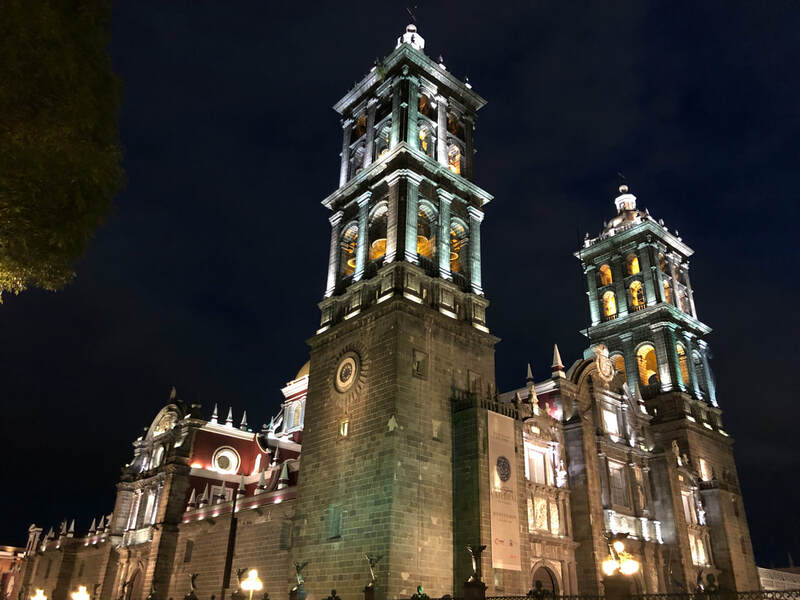 The church in the centre plaza, ​Parroquia de San Miguel Arcángel, is a must see in the daytime and at night. ​Backtracking an hour towards Mexico City, our third stop was Santiago de Querétaro, which felt like a large city after a few days in San Miguel. Full of churches and plazas, the most distinct feature of this city is the large aqueduct that runs in 1.78km from the east. Walk through the old centre area and enjoy the colonial feel. ​An hour from Santiago, Bernal makes a great day trip out of the city. Designated a "Pueblo Magico" due to its significance and location, the most iconic feature of this town is the ​Peña de Bernal. Rising up 1,421 feet, the Peña claims to be the tallest freestanding rock in the world and one of the largest monoliths. ​The town is quaint and nice to explore before or after you attempt to climb the rock. The climb starts out easy, with shops and vendors along the paved path, and then gets steep and more difficult. Make sure you sign in and out of the trail book at the bottom so you are accounted for at the end of your hike. ​Puebla City was our next stop, on our way south to Oaxaca. The Dia de los Muertos festivities were already beginning and we got to experience more of the Americanized Halloween activities. As night fell, the beautiful main square filled with creepy characters dressed up to frighten bystanders. In the day, Puebla was a cute little town and definitely worth a stop. 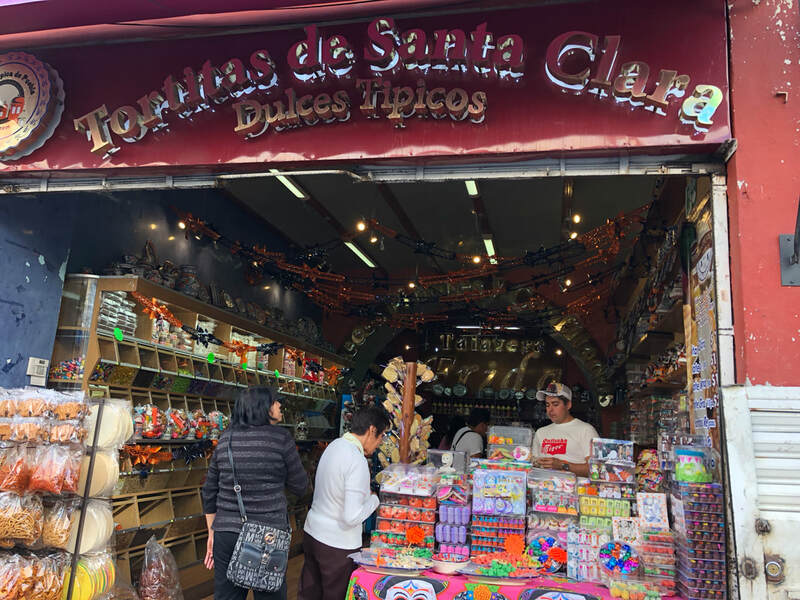 There is an entire street dedicated to candy stores- La Calle de los Dulces. 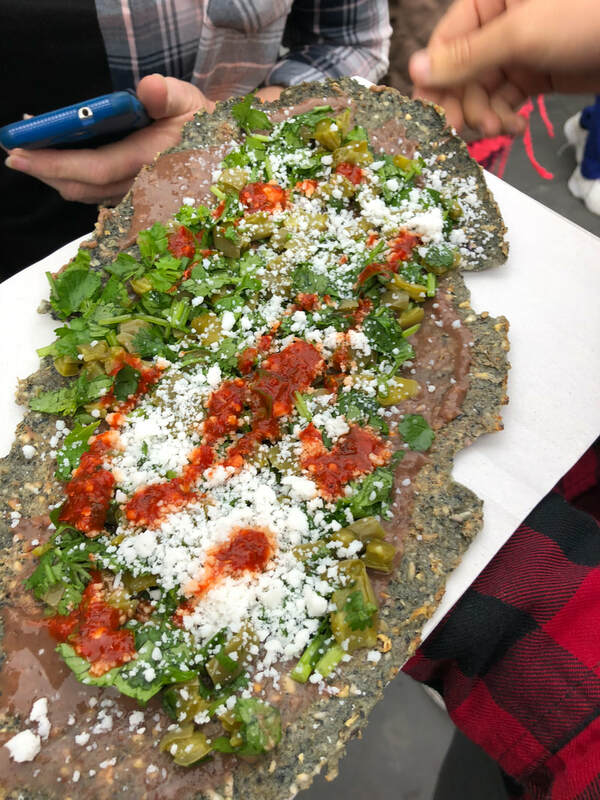 Puebla is also the birthplace of the famous Mole Poblano. This is a rich sauce made from a blend of chiles, spices, and chocolate. It is served on a variety of dishes, including chicken. Chocolate and chicken is definitely a different combination, but when in Puebla. 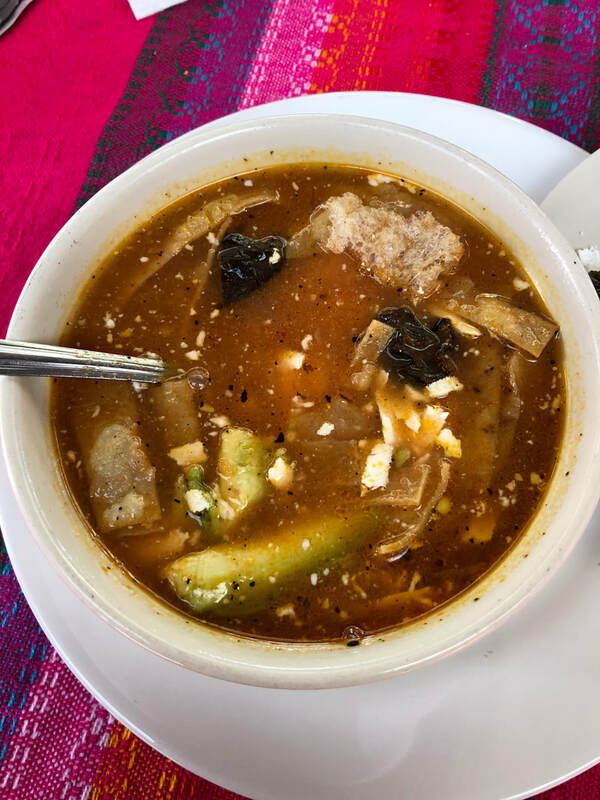 ​To the north of the town, Barrio de Xanenetla can be found. The murals and paintings in the Xanenetla neighbourhood make this area perfect to explore on foot. Close by you can also find the Puebla cable car if you want a view from up above. 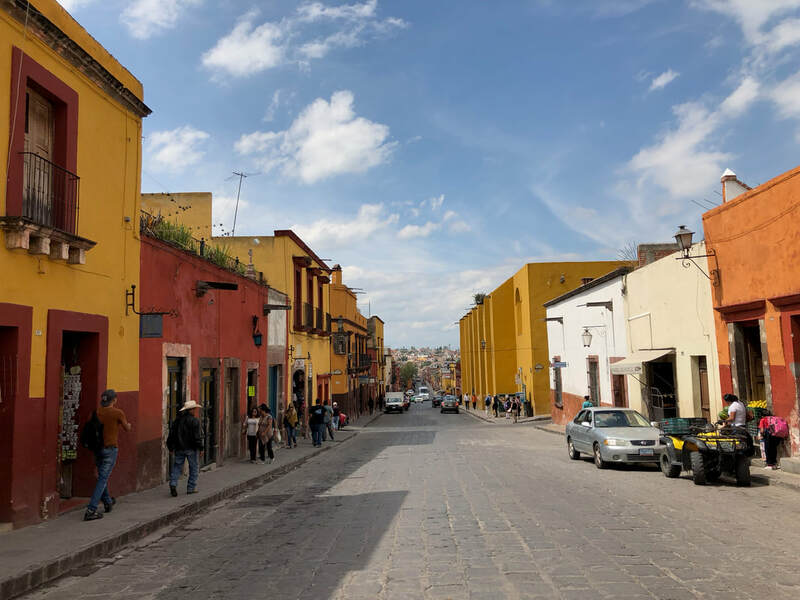 ​A short 30 minute drive (or Uber) away is the town of Cholula. ​The Iglesia de Nuestra Señora de los Remedios, a yellow Catholic church, can be spotted as you approach the centre, as it is situated on top of what looks like a hill. This hill is actually The Great Pyramid of Cholula, also known as Tlachihualtepetl. ​The church was built on top of the archaeological site by the Spanish in 1574. The pyramid is one of the largest in the world, with 8km of tunnels discovered inside of it. You can explore some of these tunnels with a visit to the site. Our main destination for this Mexico trip was to experience the Dia de los Muertos (Day of the Dead) celebrations in Oaxaca. We arrived in the city on Halloween and preparations for the festivities had already begun. Celebrations take place from October 29-November 4, but the main days are November 1 & 2. ​We had some time free during the days so we made sure to check out some interesting places nearby. Hierve el Agua is one such place, located 1.5 hours east of Oaxaca City. The waterfalls are petrified and you can see them from the main viewing area, where there are also outdoor pool areas you can relax in. ​It was very busy when we went to visit, so we spent most our time taking in the amazing view. There are trails you can hike to take you closer to the waterfalls if its not too hot. ​Another Mexican claim to fame is El Árbol del Tule, a Montezuma cypress tree on the grounds of a church in Santa María del Tule, 30 minutes outside of Oaxaca City. It measures more than 119 feet around and is said to be the widest tree in the world. The tree is fenced off in the church yard, so its a bit of a tourist trap, but the tree itself is impressive. Dia de los Muertos is a lovely tradition the Mexican culture celebrates to remember family and friends that have passed. It is believed that the spirits of the dead come back to visit on these days, and this is celebrated, not feared. We have wanted to witness this tradition for a long time, but unfortunately it is becoming more well-known in the Western world (thanks to things like Coco the movie), and with that comes more tourists. We were told that some of the celebrations have changed for the locals, as they want their time to be with their families and not viewed by strangers. There was a schedule of events published by the city of Oaxaca, but this seemed to be for more public events, shows and performances. It was more challenging than we expected to find the authentic festivities that didn't feel created for tourists. The best thing you can do is just wander through the town and take in everything around you. Don't be surprised is a random parade of people dancing erupts in the street beside you. ​No matter where you go, you will come across the beautiful alters created for the celebrations. These altars are used to welcome ancestors' spirits back into the home. They are filled with photos of relatives, flowers, food items, sugar skulls and other items of significance to the family. ​The altars in the city centre are huge, elaborate and impressive, but the altars located near or in homes have a more personal and intimate feel. The time, dedication and detail that go into the alters is admiral and fascinating. ​Face painting is offered on every street corner and we were unsure of how it was viewed by the locals. Most public venues are accepting of tourists and face painting and many locals also dress up and have their faces painted but it seems more appropriate for children. ​Nearly every tourist took part in getting their face done up and we did end up going for it on one of the nights. There are certain cemeteries and more formal areas where its seen as being disrespectful, so be aware of your surroundings and get a gauge for the crowd you are in. ​Aside from the celebrations at home, a large portion of the celebrations for locals take place in cemeteries where their relatives are buried. Trying to find the balance between being respectful and enjoying the festival was challenging. For locals this is a time of celebration and remembrance and for tourists its a eye opening and incredibly powerful experience. In general, locals are extremely accommodating and willing to share in this custom, however we did see signs of frustration as some locals struggled to get into the cemeteries to pay respects to their family members because of large crowds. Some of the cemeteries in the city centre, that we were told to visit, were actually closed to visitors during the evenings. We were told this was because there was now too many people visiting them. During the day you can visit the cemeteries to see the elaborate grave decorations that are created by family members. At night, if you are lucky to find the right place, you can witness the beautiful tradition of the families celebrating their loved ones. Try to be aware and courteous, and not to linger too long. There are lots of incredible activities to be experienced all across the city. ​Our final stop before flying out of Mexico was ​Puerto Escondido. This seaside town is home to the Mexpipe surf wave and several surf competitions. In November, the weather is hot, the waves are quite small (compared to rainy season) and the town is quiet, with every restaurant and bar beckoning you in to fill the empty tables. The beach is lovely but because of large waves and strong currents swimming is only enjoyable in certain spots. It was the perfect place to enjoy a few days of calm after the Dia de los Muertos celebrations ended. Questions about travelling in Mexico? Email us and we will be happy to help!